The ruined, remnant form of what was once a Fallen Angel Digimon that fell into the Dark Area, pursuing strength and destruction. However, its wickedness was refined even more, so that its dark powers are unfathomable. 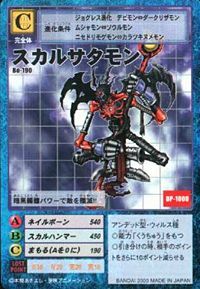 Its Digicore, concentrated with mighty powers of darkness, is the characteristic of Demon-species Digimon called the "Dark Core". Its Special Move "Nail Bone" is a terrifying technique which fires a powerful light from the jewel at the end of its staff, which disrupts and obliterates the opponent's data. 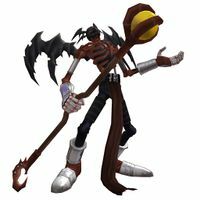 An Undead Digimon. It is the mere shadow of what was once a Fallen Angel Digimon that pursued strength and destructive power. Its Special Move is "Nail Bone". 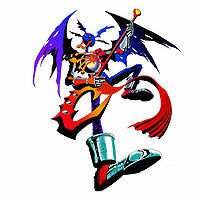 The Fallen Angel Digimon that pursued strength and destruction is a fallen figure. It is a subordinate of the Royal Knights that acquired dark power with the "Dark Core", a computer kernel filled with mighty power, in its hand. — Digimon Frontier: "Annihilation of the Hometown! 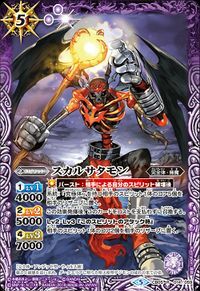 Skull Satamon, the Messenger from Hell"
| Sata is short for Satan (「サタン」 Satan). 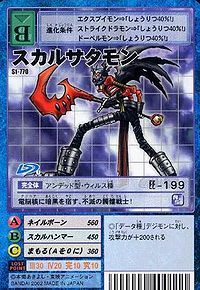 Anime/Manga Digimon Adventure V-Tamer 01: "Another Tamer"
Nail Bone  ネイルボーン Neiru Bōn Bone Blaster/Blaze Spear/Nail Bone Fires a powerful light from the jewel at the end of its staff to disrupt and obliterate the opponent's data. 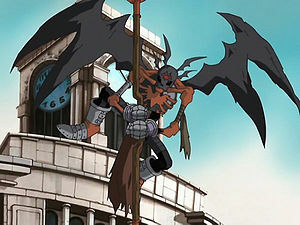 Skull Satamon was a servant of Demon. When the Demon Corps began hunting down Ken to recapture the Dark Seed that had been implanted in him Skull Satamon first defeated all of the first generations Perfect level Digimon then battled against Daisuke and Ken's Imperialdramon. At first, it appeared that Skull Satamon would defeat Imperialdramon also after he disabled him with his Nail Bone attack. 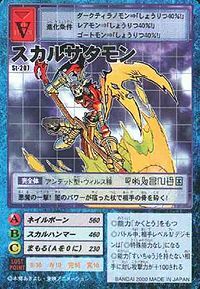 But all of the first generation Digimon gave their Digicores to Imperialdramon it enabled him to mode change to Fighter Mode and vaporize Skull Satamon with the Positron Laser. 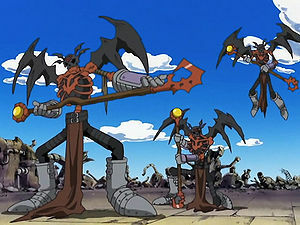 Three Skull Satamon were underlings to the Royal Knights. They were charged with sizing the Digicode of Flame City. They fight against Kaiser Greymon and Magna Garurumon for a while but are defeated. Lord Knightmon betrays then and scans their data, along with the data of Flame City. 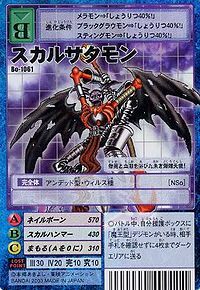 Skull Satamon was a servant of Skull Knightmon. 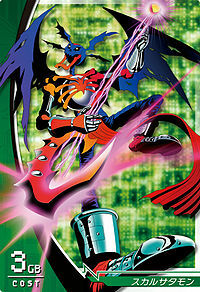 He battles Cyberdramon but is defeated and later forced into a DigiXros by Dark Knightmon's Darkness Loader evolving into Super Dark Knightmon. 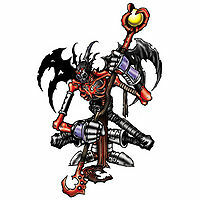 A Skull Satamon was created when Saiba Neo jogressed Devimon and Ogremon together. A Skull Satamon guarded Mikihara Norn' cell. 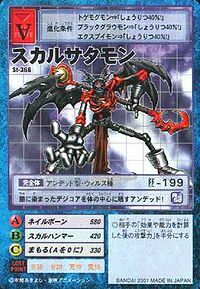 Skull Satamon is a Land-type Variable Digimon that can be learned by the combination of Devimon and Ogremon. Its technique, Nail Bone, allows the user to attack an opponent twice in a turn. It is classified as Ultimate instead of Perfect in these game. Evolves from Devimon at level 31, and evolves into Beelzebumon at level 41. It is the natural Perfect stage in Impmon's evolution line. 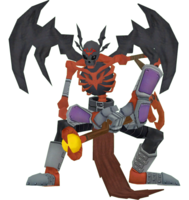 Skull Satamon is available as a Digimon Medal. 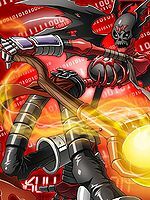 Skull Satamon is the boss Digimon of Secret B and an enemy Digimon in Secret S.
The demon attacks! It crushes the enemy's bones with its staff of darkness! 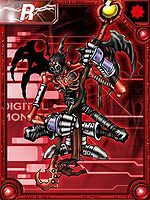 This Undead Digimon's Digicore lies at the center of its body, stained with darkness! Darkness lies in its Digicore, an immortal skull warrior! It annihilates its enemies with its dark skeletal powers!! This vermilion skull angel is showered in hatred and blood! The final remnant of a Fallen Angel Digimon that was further refined with malevolence in pursuit of strength and destruction. The Dark Core in its body is the result of a Digicore being concentrated with the power of darkness. The ruined, remnant form of what was once a Fallen Angel Digimon that fell into the Dark Area, pursuing strength and destruction. ↑ 9.0 9.1 Digimon Adventure V-Tamer 01: "Another Tamer"
↑ Skull Satamon was adopted from a winning Digimon entry in the First Original Digimon Contest (Digimon Web). This page was last modified on 22 April 2019, at 05:57.